The XLIGHT Premium porcelain tile by Urbatek can reinforce that idea of a spa at home, thanks to its large format and the nature and purity provided to the atmosphere. 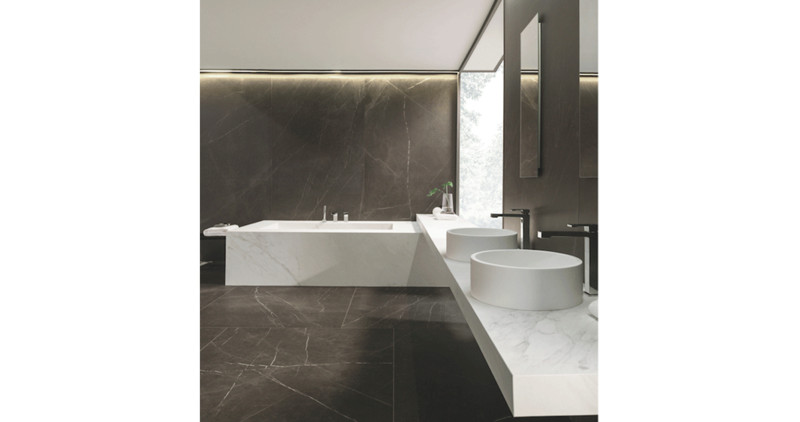 Its marble finish conveys a kind of tranquillity in the wall tiles and its composition enables the creation of a sense of continuity. 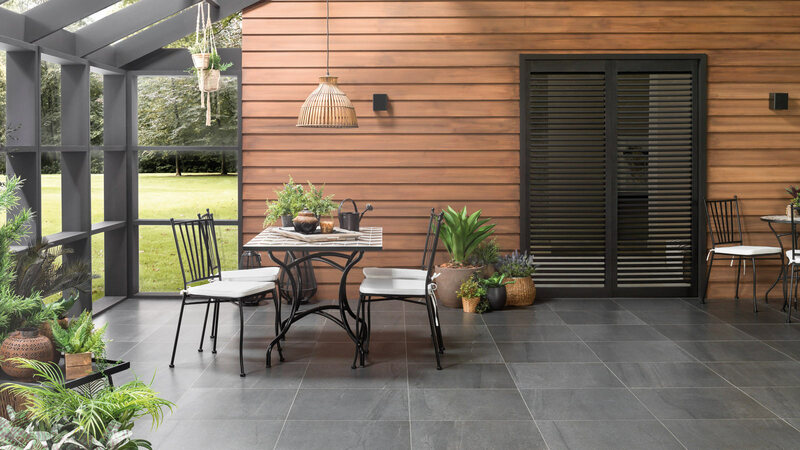 For instance, the XLIGHT Savage Dark finish, which would give a minimal touch and, the same as the other XLIGHT models, would be installed on floors and walls with no need for a material change. 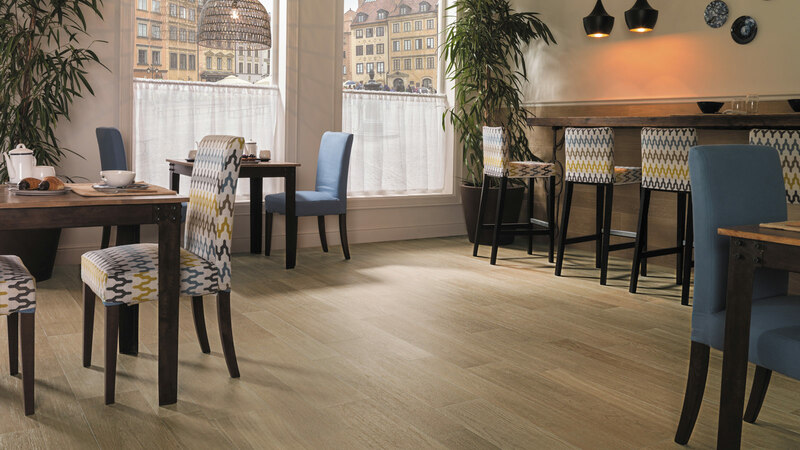 This high-range technology with a huge number of shades enables the creation of wide open spaces which offer a relaxing atmosphere, something which is strengthened through the touch of the Nature finish. 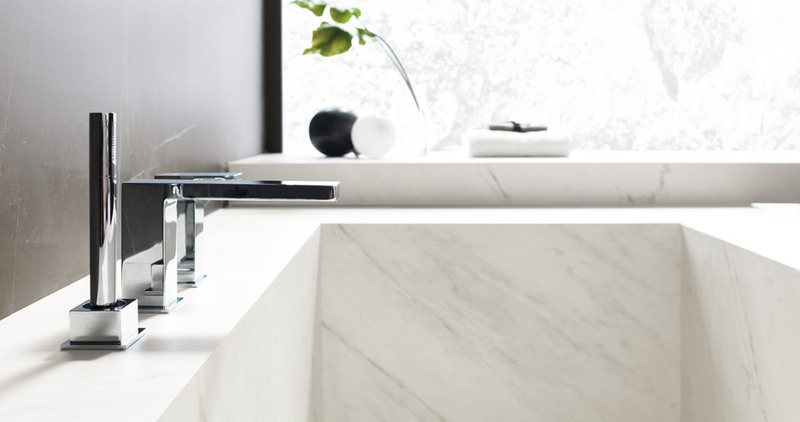 Envisioning a bathroom where anything is possible becomes a reality thanks to a collection which is able to create custom-made, timeless and elegant cutting-edge spaces. In order to enhance the idea of an infinite room, Noken offers the NK Logic models and the Irta collection for the bathtub and basin taps. Both series easily suit any atmosphere thanks to their aesthetics. The NK Logic taps present an elegant design which joins functionality and beauty, and at the same time, they help to create a sense of spaciousness. For its part, Irta provides the bathroom with order and tranquillity through its straight lines and sharp angles. 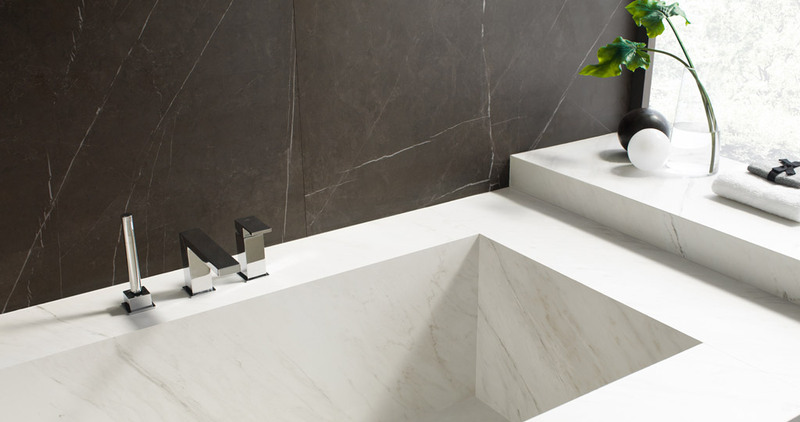 Among the lines from Noken for designing XXL trend bathrooms, the Lounge Square bathtub and the Pure Line basins could not be left out. Both pieces stand out because of their aesthetics and sophisticated exclusive design. 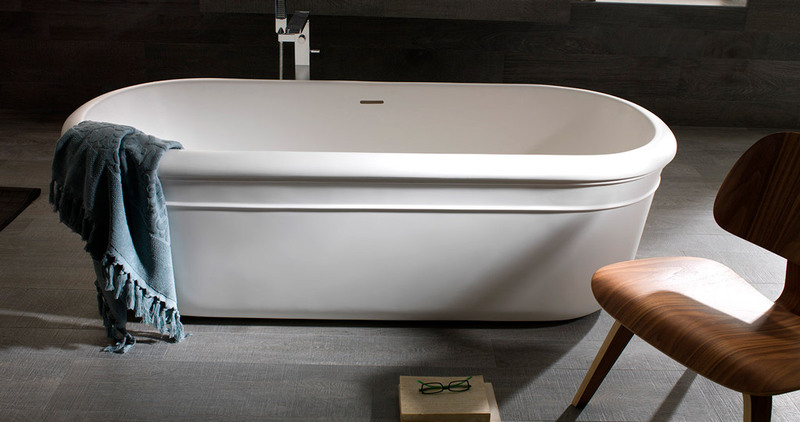 On one hand, the Lounge Square bathtub combines the purity of straight lines with the rounded edges, whereas on the other hand, the Pure Line basins bank on minimalism. A perfect atmosphere for unique relaxing experiences in the bathroom. 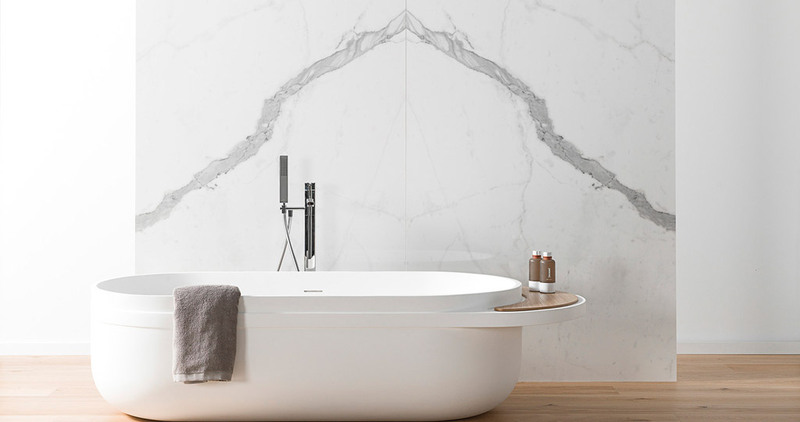 By completing the designs from the PORCELANOSA Grupo for wellness spaces inside a house, Systempool banks on the KRION® Solid Surface mineral compact to conceive double ended bathtubs. These kinds of pieces have been designed to be used by two people at the same time, they are symmetrical and the drain is located in the middle so that the visual impact is strengthened. The models Aro, Aro Nogal, Pure and Epoque stand out because of their cosmopolitan look and they are perfect for creating bathrooms which convey a sense of rest. 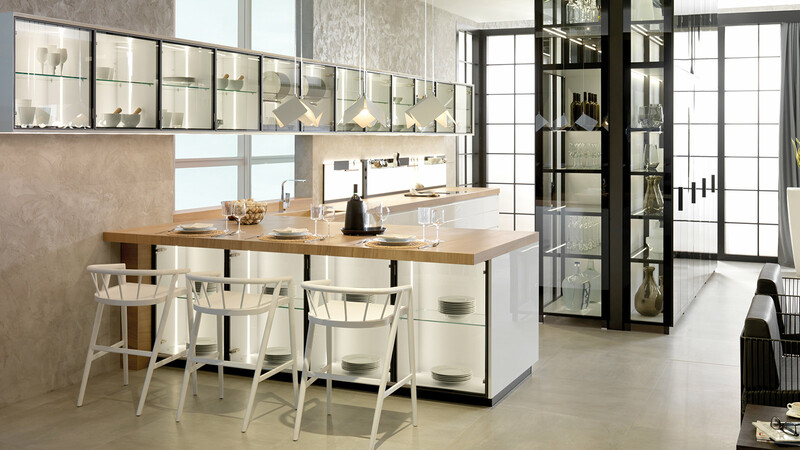 Their aesthetics is strengthened by the features offered by this state-of-the-art solid surface, which are: warmth, zero-porosity, durability, repairability, low maintenance and easy cleaning. 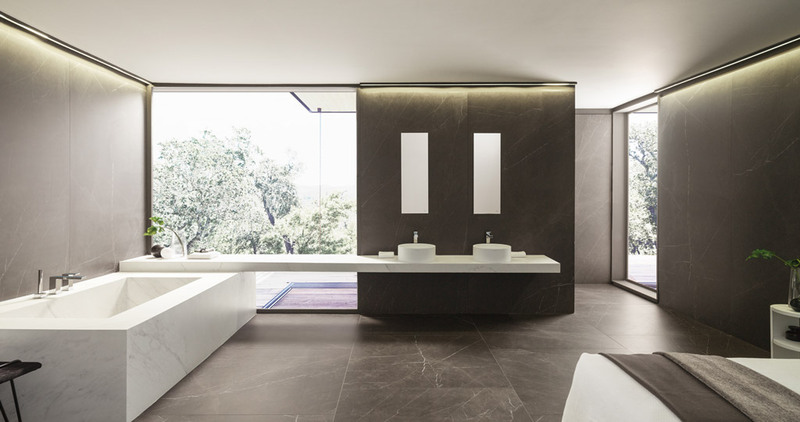 Following the wellness trends, relaxing and escaping from the daily routine in one’s own house spa becomes a real possibility thanks to the PORCELANOSA Grupo. Top quality and versatility in materials for a unique bathroom experience.